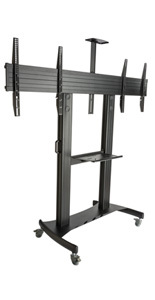 What features are important to consider when choosing flat screen display racks? 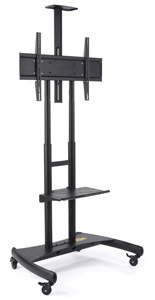 Beginning with size, our widescreen LCD TV monitor stands are 32” to 93” tall. 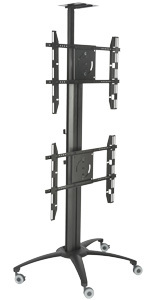 The VESA-compatible brackets will support a broad array of plasma televisions. 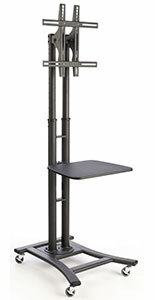 Our widescreen LCD TV monitor stands are compatible with screens sized 42" to 72". 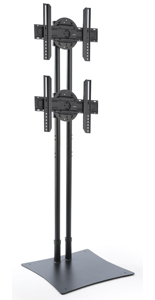 Choose stationary mounts in landscape orientation when playing videos or media programming. For advertising purposes, you'll need brackets that tilt and rotate 360° for viewing branded content horizontally and vertically. 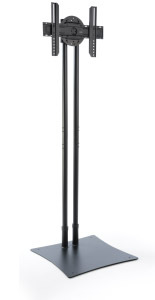 Next, select a base style. 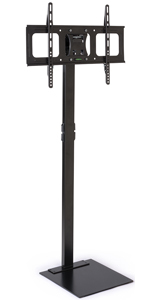 Will your media be permanently displayed, or will you be taking it on the road to various locations? 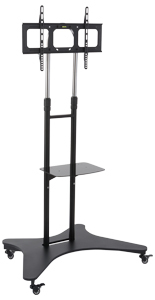 Our widescreen LCD TV monitor stands come in fixed, and portable styles with gliding casters. 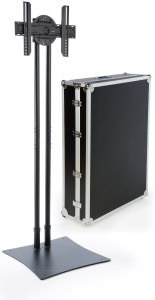 For the latter, hard shell travel cases are provided to protect equipment during transit. 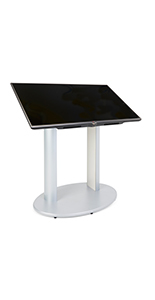 Fixed pedestal bases are round, square, rectangular, or cross-style in metal or tempered glass. 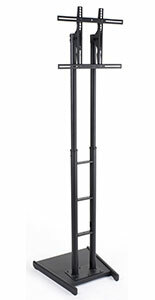 Wheeled display racks are great for salespeople, lecturers, and retailers who travel, usually alone, with heavy equipment. 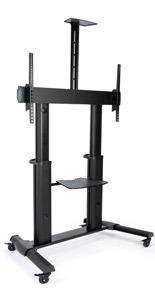 Where are flat screen display racks used? 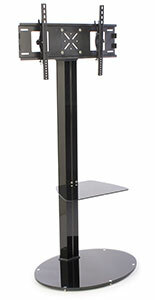 Widescreen LCD TV monitor stands are seen at trade shows and sales expos in hotels and convention centers. 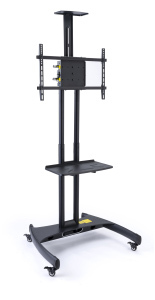 Our media racks come alone, or with shelves or countertops for AV equipment, product demos, sample giveaways, or laying out promotional material. 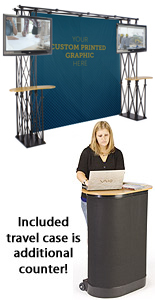 One style has a backdrop to create an exhibit-like atmosphere when you don't have a booth, or if the venue decor is drab. 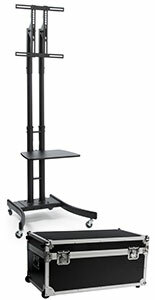 Multimedia racks are used in high school and college auditoriums to support academic lectures, classroom lessons, and lab activities. 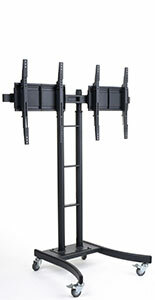 Our mobile TV holders are easy to set up, breakdown, and transport. 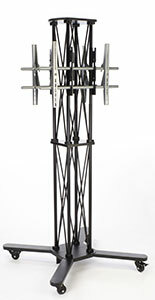 Check out our floor standing truss displays that require no tools for assembly! 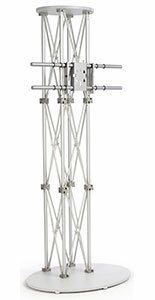 They set up in minutes and make a high-tech statement on showroom and convention floors. 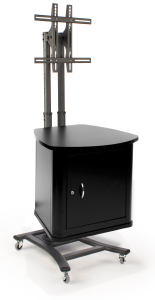 Universal flat screen holders are used by doctors and nurses in hospitals and medical offices for analyzing diagnostics, collecting patient information, and record keeping. 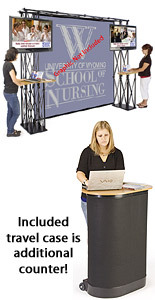 They are also used to support lectures at teaching hospitals, and as entertainment centers in waiting rooms. 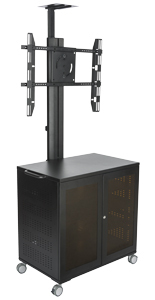 Large LCD racks are popular in casinos, athletic centers, and sports stadiums. 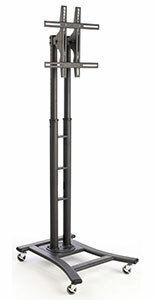 Stream live TV, play videos, or display advertising slide shows and static messages, game scores, exercise or concert schedules. 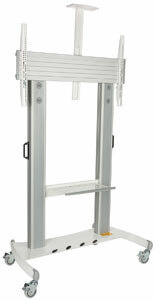 Dispense trifolds and catalogs from acrylic or mesh pockets and trays underneath the display. 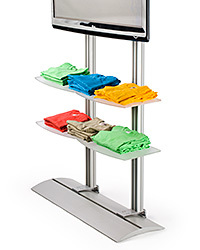 Multimedia kiosks for digital advertising presentations in retail showrooms boost brand recognition. Create hype around new products and stream how-to videos. 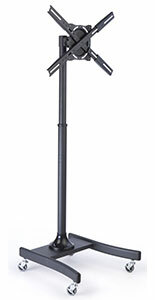 Malls use digital signage for wayfinding purposes. 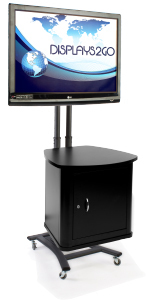 Flat screen displays are popular in auto showrooms for launching new car campaigns. 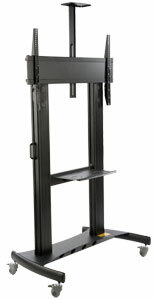 Plasma screen television holders with tiered magazine pockets dispense catalogs and brochures so customers can stay connected with your business. 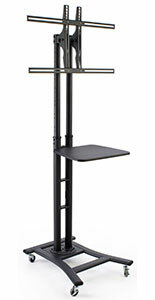 All of these mobile media stands and fixed pedestal displays are great collaborative tools in professional offices. 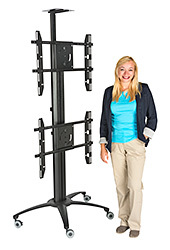 Present powerpoints, conduct skills training sessions, and organize team-building exercises for employees using our versatile TV racks. 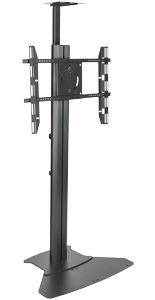 Our television displays come in 1- and 2-sided configurations, with single- or multiple flat screens. 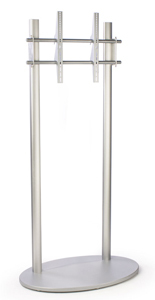 Our holders have steel and aluminum construction that stands up to repeated use. 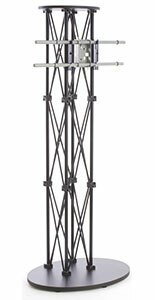 Powder coated finishes protect these fixtures from dings and scratches. 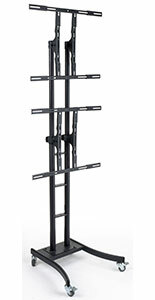 Available in silver and black, our commercial-grade flat screen display racks blend with any decor. 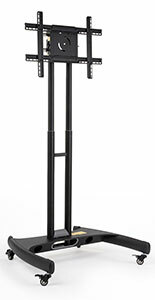 Shop Displays2go for flat panel stands for trade shows in an array of styles. 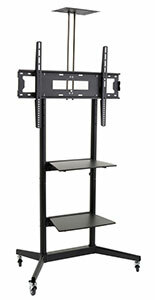 Whether mounting a TV or nine monitors, we offer commercial plasma screen racks that blend style with functionality. 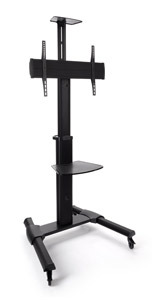 Some of our sleek stands are used to replace bulky entertainment centers in the home! 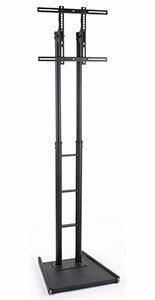 Ask about bulk pricing and fast shipping on in-stock items.